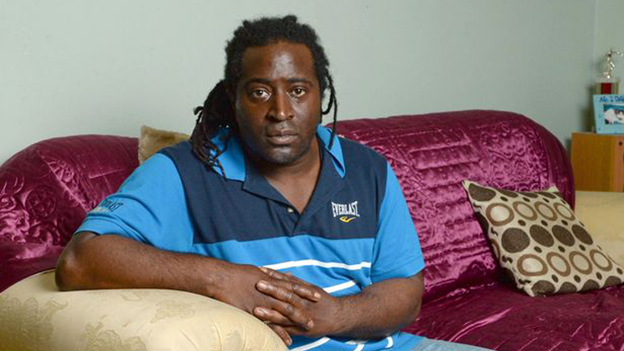 Cornelius Thomas who was tasered four times by West Midlands Police. West Midlands Police has agreed to pay “substantial” undisclosed damages to a dad who was Tasered FOUR times by officers outside his home - including in his back. Cornelius Thomas, 39, claimed he was victim of a “gratuitous, unprovoked, and violent” attack when he returned to his Kings Heath property with his eight-year-old daughter. He said he was Tasered by officers who had arrived to support mental health workers who wanted to take him to a psychiatric unit for treatment. Now the force has made an undisclosed payout after the incident in June 2011, although it stated no disciplinary action was taken against any officers. Speaking after the out-of-court settlement was agreed, Mr Thomas said he still gets panic attacks whenever he sees police officers. He added: “It would be fair to say that I’m not too keen on the police anymore. Mr Thomas suffered injuries to his wrist and bruises when he fell during the confrontation. A Taser barb was discovered embedded in his chest when he arrived at hospital. He added: “I have never received anything like a written apology for what happened, but I am glad it is now over. Mr Thomas was diagnosed with bipolar disorder in 1999 and has received help for his condition since 2001. Four police officers were brought in to support mental health staff in June 2011 who had decided to section him under the Mental Health Act. He went on to spend more than a month in hospital. Mr Thomas, who was unaware of the decision to section him, had arrived home with his daughter at 8pm to find two police cars and an ambulance parked outside. His legal team said the force later admitted in court documents that the dad was forcibly pulled from his car and Tasered in his chest, twice in his upper torso and once as he turned his back. His solicitor, Iain Gould, said: “On each occasion my client was Tasered, he says he felt a surge of electricity, intense pain and fear. “Each taser resulted in Cornelius falling to the ground suffering multiple minor soft tissue injuries, but he managed to get up and move a little closer to his front door. “On the fourth and final occasion that he was tasered, he says both his hands were in full view and that he was clearly no threat. "At this point Cornelius had his back to the police, his left hand on the door handle, and his right hand on the keys in the lock. West Midlands Police denied liability, arguing use of the Taser was “lawful, justified and proportionate in the circumstances”. However, after Mr Gould issued court proceedings the force settled the claim out-of-court for what he described as “substantial” damages and legal costs. A West Midlands Police spokesman said: “An out of court settlement has been agreed with Mr Thomas for an undisclosed amount, without any admission of liability by West Midlands Police.